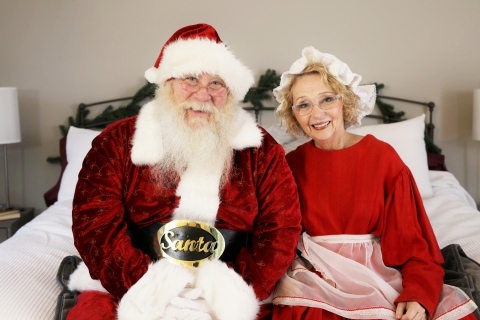 Sleep Number announced today that it is the official bed of Santa and Mrs. Claus. As the famous song tells us – “He sees you when you’re sleeping, he knows when you’re awake” – Santa has been looking out for sleepers for many years. Now Sleep Number is making it possible for people around the world to keep an eye on how the man-with-the-bag and Mrs. Claus are sleeping. While his bundle of toys brings joy to children all over the world, the long hours in the workshop spent filling his bag were taking their toll on Santa. This holiday season, the Sleep Number® bed offers the famous couple much needed rest and recovery as they gear up for their busiest time of the year. Using their Sleep Number 360™ smart bed’s SleepIQ® technology, Santa and Mrs. Claus have learned how to get the most out of their sleep, and want to share those insights with families during the busy holidays. Keep up with the Clauses as they prepare for the big night at https://www.sleepnumber.com/santawatch. How does Mrs. Claus deal with Santa’s snoring? Or, how has Mrs. Claus’ nighttime meditation helped her racing mind? Each day, visitors get a glimpse inside their life at the North Pole, including the couple’s sleeping habits, their Sleep Number® settings, and what’s at the top of their lists this year. When compared to other generations, baby boomers are most likely to say they will not give up sleep in order to get it all done during the holiday season (52%), compared to Gen Xers (35%) and millennials (27%). Millennials are sacrificing sleep more than other age groups throughout the holiday season – they’re most likely to stay up late for Black Friday shopping, and lay awake due to holiday-related stress. In addition, this group is most likely to skip their workouts during the holiday season. Most who lay awake at night don’t have sugar plums dancing in their heads. 38% say they are stressed about shopping, and hosting family and friends. Overall, 57% of people said they will not skimp on sleep to shop for Black Friday deals. Men ages 55+ are most likely to be early birds… ahem, Santa! Thirty years ago, Sleep Number transformed the mattress industry with the idea that ‘one size does not fit all’ when it comes to sleep. As the pioneer in biometric sleep tracking and adjustability, Sleep Number is proving the connection between quality sleep and health and wellbeing. Dedicated to individualizing sleep experiences, the company’s 4,000 team members are improving lives with innovative sleep solutions. To find better quality sleep visit one of the 550 Sleep Number® stores located in 49 states or SleepNumber.com. For additional information, visit our newsroom and investor relations site.